difference between baking soda and baking powder? For a floundering baker like myself, it’s not like my larder is stocked with every possible baking accessory and ingredient. Invariably, if a recipe calls baking soda, I will only be able to dig out baking powder, and vice versa. So, I’ve often pondered: what’s the big difference? They sound and look almost exactly the same: Can I substitute one for the other? Baking powder and bicarbonate of soda are the two raising agents I use to make bakes rise or spread out. For any chemistry geeks like me who want to know how they work, here’s a brief explanation. A reaction between an acid and a base creates carbon dioxide bubbles, which cause a cake mixture to rise. Bicarbonate of soda is a base, so an acidic ingredient needs to be present in the mixture for it to react with the bubbles. Lemon juice, buttermilk, or cocoa power, among many others, do the trick. 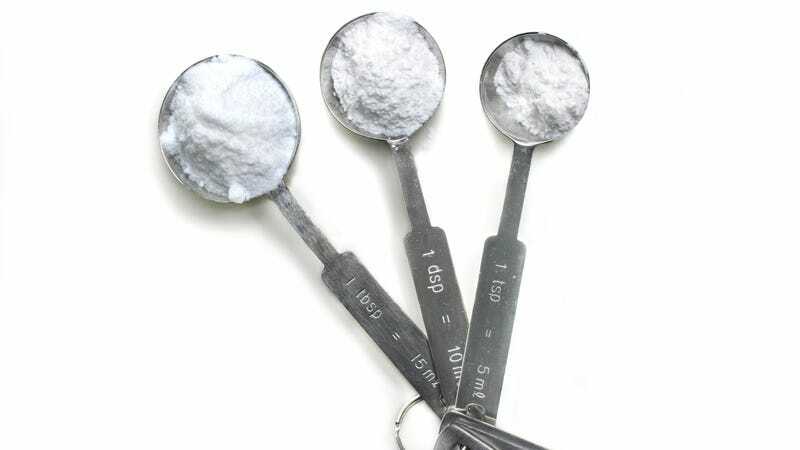 Baking powder is a combination of soda (a base) and cream of tartar (an acid), so both the acid and base required for the reaction are already present, and your bake will rise with no further assistance. Westgor agrees: Baking soda is a base and needs added acids to make it do its job, whereas baking powder is a “complete leavener” and when it’s introduced to moisture, it needs no added acid to react. This is why you use baking soda in a cookie like chocolate chip, as it doesn’t need to puff up much, and use baking powder for a fluffier cake. That’s also why that cake can also be in danger of “falling”; not so with the cookie. Patricia Kim, pastry chef at Chicago’s Gemini, puts it the difference between powder and soda this way: “Both are leavening agents but baking powder has two active ingredients, so it will give it an initial boost and then a secondary one,” one when it’s mixed in to the batter, and one when it reacts to the heat in the oven.